FORBES | Today we have a massive and growing public health challenge that is substantially shortening the lives of millions, negatively impacting the health of our children, and adding an astounding $170 billion in health care costs to our nation annually. Unknown to most, it has been for years the leading cause of preventable death in the United States. But a new policy approach that 11 states and over 450 cities and counties have adopted is making promising inroads in this health challenge. In January, we were honored to co-chair the inaugural meeting of the Health Affairs Council on Health Care Spending and Value. This diverse group of 22 health care leaders has come together to stimulate a national discussion about whether we should—and how we could—constrain what feels like runaway health care spending. An explicit conversation about this issue has long been taboo in US health policy and politics, but with health care now consuming 17.9 percent of our gross domestic product (GDP)—up from 5 percent in 1960—that time is over. It is time for us to speak boldly and thoughtfully about the wisdom, sustainability, and return on investment of these levels of funding and examine the consequences of continuing health care cost growth along the lines of what we have seen in the past few decades. The council’s formal charge, which will shape a three-year work plan and recommendations, is “to provide a focal point for evidence-based discussion, analysis, and action regarding what we get for our health care spending in the US, whether it is worth it, and how we might collectively take a more deliberate approach toward maximizing our investment in health care.” We want to ask tough questions, checking our allegiances and party affiliations at the door, and together, find evidence-based answers that are desperately needed to move this dialog forward. A decade ago, the nonprofit State Collaborative for Reforming Education, or SCORE, began collaborating with Tennessee’s leaders, educators, and community and education advocates to make Tennessee one of the fastest-improving states in the nation. Children in Tennessee today have better opportunities for success in college and career than any Tennesseans in history, and we are proud of the state’s unprecedented progress in student achievement. But as SCORE enters its second decade of service and releases our newest State of Education in Tennessee report, we want to see our students climb higher and faster. FORBES | In Middle Tennessee, we are known for excellence in health care services, music, and economic growth. However, one distinction we would like to relinquish is being home to the national park with the highest number of suicides in the United States. According to an analysis by Outdoor Magazine, the Natchez Trace Parkway is one of the nation’s deadliest parks with 25 suicide deaths from the Natchez Trace Parkway Bridge between January 2006 and September 2016. In recent years, the suicide rate has climbed, with five deaths in 2017 and three this past year. Suicide has become a public health crisis in my home of Williamson County, Tennessee, one that was brought to my attention by my wife Tracy through her work on the board of Centerstone. More tragedies are preventable if we act swiftly and intentionally. While Ms. Judd ultimately did not attempt suicide and was able to seek and receive help, 32 others have made the devastating decision to end their lives at the Natchez Trace. Now, friends and family members of these individuals are uniting as the Natchez Trace Bridge Barrier Coalition and partnering with the nationally recognized behavioral health leader Centerstone and the Tennessee Suicide Prevention Network with a singular focus: to raise the bridge railing or install a barrier to prevent future deaths. This is a cause I whole-heartedly support. And so does the science. CNN | In his State of the Union address, President Donald Trump brought attention to a disease that has almost disappeared from the headlines: HIV/AIDS. He pledged to end the epidemic in the United States by 2030, setting commendable, ambitious goals for domestic prevention and treatment efforts. I support President Trump’s pledged investment in domestic public health but believe we must also continue to build on our nation’s 15 years of global leadership in combating HIV/AIDS. Around the world, there are still nearly 37 million people living with HIV, more than 900,000 AIDS-related deaths a year and nearly 1,000 adolescent girls and young women infected with HIV every day. We can and must lead the global fight to end this pandemic. FORBES | At a time when our nation feels like it may be torn apart with increasing partisanship and clash of cultures, there is something all Americans share in common. We all take pride in our communities, our hometowns, the places where we were born and the places where we’ve put down roots. Part of that pride comes from a shared history, one that is preserved and told through our historic buildings, landmarks, and physical structures that are often the soul and essence of our towns and cities. How can we best preserve and celebrate our past, while also meeting our communities’ needs for economic investment and job creation? One proven way lies with a little-known tax incentive that has been established at the federal level, and now is increasingly making a difference as states incorporate it into their tax codes. THE TENNESSEAN | Earlier this week, Gov. Bill Lee made the commendable decision to direct all state agencies to find ways to improve how they serve rural Tennessee regions. FORBES | As a physician and lawmaker, I have long argued that federal global health aid improves America’s standing in the world and makes us safer by steadying unstable nations. Countries with healthy workforces have improved economic outputs, stronger family units, and are less likely to become havens for terrorists. But what many may not realize is that the health of our population here at home also impacts our national security. Earlier this fall, Mission: Readiness, a group of 750 retired generals and admirals, published a new report, titled Unhealthy and Unprepared, showing that obesity is now a leading reason why 71% of young Americans are ineligible to serve in the military. This alarming trend, coupled with a decreasing number of young people interested in military service, means that our military soon may be unable to find enough recruits to protect American interests at home and abroad. And it’s already having an impact, with obesity rates cited as a major reason why the Army was not on track to meet its annual recruitment goals as of September 2018. Senator Frist presents Senator Alexander an award from the Bipartisan Policy Center for his leadership in passing the landmark 21st Century Cures Act in 2016. Lamar Alexander’s unparalleled intellect, his unwavering commitment to commonsense Tennessee values, combined with his extraordinary willingness to do the hard work (he does more in a day than most do in a week!) has led to countless achievements that have improved our lives and dramatically enhanced our well-being. Senator Alexander has been a tireless servant for the people of Tennessee, first as Governor for eight years and now as a United States Senator for the last sixteen, in addition to serving the American people as the U.S. Secretary of Education under President George H.W. Bush. I am grateful to have served with him in the United States Senate and together on the Senate Committee on Health, Education, Labor and Pensions, which he so capably chairs today. He is the master of results in the Senate. Focused always on achieving forward progress – not political posturing – Lamar has led the way in writing, crafting and passing many of our most impactful laws, including the 21st Century Cures Act to speed the next generation of cures and treatments to patients, the Every Student Succeeds Act to improve our federal education system and reform No Child Left Behind, the America COMPETES Act to invest in American innovation, and the SUPPORT for Patients and Communities Act to smartly tackle the ongoing opioid epidemic. While Washington seems to increase in partisanship with each passing year, Lamar keeps his head down, vets and develops evidence-based solutions that will serve the American people and quietly and effectively cultivates broad support from both sides of the aisle. He is a true statesman and a trusted, honest negotiator whose leadership in Congress has reflected the best of who we are as Americans. FORBES | This World AIDS Day, we celebrate the astounding progress made in the past 15 years! Thanks to PEPFAR— the U.S. President’s Emergency Plan for AIDS Relief—14.6 million people living with HIV (59%) have access to antiretroviral therapy. More than 2.4 million babies have been born HIV-free. Countless lives have been saved. This progress was unthinkable when I was a surgical resident in training in the 1980s, studying the latest medical literature and tracking this mysterious new virus. On my annual medical mission trips to Africa, I saw the virus at scale. My clinics overflowed with AIDS patients. I watched the virus hollow out entire societies, taking first the most productive members at the prime of their lives — teachers, police, civil servants, mothers. I knew there was not much a surgeon could do for a patient dying of AIDS. But in the late 1990s, I wasn’t only a surgeon. I had a new set of colleagues who wielded different tools. I shared stories and photos and data with my fellow Senators. I found allies on both sides of the aisle who grasped the scale of the problem, but also saw—with hope—an opportunity to help. Joe Biden, Barbara Lee, John Kerry, Jesse Helms and others shared my concern. FORBES | The November elections left us with a lot to digest—it wasn’t the decisive “blue wave” that some were predicting, but the tea leaves did tell us some interesting things about what voters believe and value, particularly when it comes to healthcare. FORBES | Last week I had the honor of kicking off the third annual Distributed Health conference in Nashville, which brought together leaders in healthcare as well as blockchain innovators from across the nation. All were united by the shared belief that blockchain has transformative potential for health and healthcare, with changes already underway. I am particularly excited about the potential that blockchain has for the healthcare industry. FORBES | Why do politics matter to health? Because government, when focused, can do incredible things to move our health forward. Here are just two examples that I was directly involved with while in the United States Senate. FORBES | In June of 1948 there was a crisis in Berlin. The Soviet Union—one of four countries tasked with redeveloping Germany after its World War II loss—set up a blockade around the capital city. By cutting off food, water, electricity, and other supplies, the Soviets expected to take over a starved Berlin and expand Soviet reach. The Allies wouldn’t care, the Soviets reasoned. The United Kingdom, France, and the United States, the other countries committed to redeveloping Germany, certainly wouldn’t go to any trouble for the Germans trapped in West Berlin. Those countries had their own rebuilding to do. While they were busy elsewhere, the Soviets expected to push out the Allies’ presence and erase the dot of democracy. NBC NEWS | Practically every community in America, and most families, are facing the still-growing opioid epidemic that is tearing at the soul of our health and wellbeing. The Centers for Disease Control and Prevention estimates 115 Americans die each day from opioid-related overdoses, and research suggests that misuse of prescription opioids is a risk factor for heroinuse. It is thus critical that we find policy solutions that both turn the tide on opioid misuse and addiction now and make it less likely that we repeat in the long-term the same mistakes that led to the crisis. To do so successfully, we must first fully understand the many fundamental drivers of this crisis; there is no single root cause of the epidemic, and multiple segments of society bear some responsibility. USA TODAY | This summer has seen the unprecedented and simultaneous outbreak of six of eight diseases posing the greatest threats to public health, according to the World Health Organization. You’d think that after the alarmingly fast spread of Ebola in West Africa just a few years ago, we’d have learned our lesson. Instead, the health intervention that has saved more lives than any other in recorded history remains alarmingly absent in global health care. That poses an immediate and long-term danger to us all. We call it WASH — water, sanitation and hygiene. It’s the most critical resource in my preparation for every surgical procedure I performed over my lifetime, and it is dismally deficient or nonexistent in hundreds of thousands of health care facilities around the world. Not only are we wasting billions of dollars in health care costs and lost productivity, we’re undercutting our most effective front-line defense in disease prevention and containment. THE HILL | A little-discussed condition raises the risk of premature death by up to 50 percent—making it a health hazard at least as significant as smoking and alcohol and more so than obesity. Yet many medical professionals haven’t heard about it, and the public remains largely in the dark. FORBES | Twenty years ago tomorrow was one of the most memorable days in my U.S. Senate career. And it haunts me still. BIPARTISAN POLICY CENTER | On June 7, 2018, Tivity Health’s Donato Tramuto and I convened a roundtable at the Bipartisan Policy Center to discuss challenges and potential solutions to address a little-discussed public health crisis: social isolation and our aging population. What many don’t realize is that social isolation could be an even bigger public health threat than smoking or obesity and it could raise the risk of premature death by up to 50 percent. Today, we’re excited to release the findings from our roundtable, which we hope will help fuel a national discussion and call to action to reverse an epidemic of loneliness. FORBES | Brett Kavanaugh will make a terrific Supreme Court Justice, and I know from firsthand experience. Earlier this week, the New York Times ran a photo of me with Kavanaugh taken over 12 years ago when then-Majority Whip Mitch McConnell and I spearheaded his Senate confirmation. Seeing that photo brought me back to my time as Majority Leader — I had made it a priority to advance judicial nominees who would practice judicial restraint and interpret the law strictly and impartially. Brett Kavanaugh was one of those nominees. FORBES | I’ve got one big idea that can change your health. But first some history. Heart transplants were once rare. When I was training to be a heart transplant surgeon at Stanford, at every opportunity I would go to the operating room to observe and study my mentor (and the “father of heart transplantation”) Dr. Norm Shumway masterfully cut out a fatally diseased heart and replace it with a strong healthy one, always amazed at that miraculous moment when it sprung back to life. Observing these rare operations was invaluable to me as a trainee, but nothing compared to that first experience of actually holding the scalpel in my own hand, making the initial, fateful incision, and deciding precisely where to place each stitch. Over time, I created the muscle memory that would allow me to safely perform heart transplants well over a hundred times in the years ahead. It was the timeworn, slightly hyperbolic, surgical mantra, “See one, do one, teach one.” It was the best we had at the time. But is that really the best, or safest, way to learn? Or do patients deserve more? As virtual reality (VR) software becomes more sophisticated, users are able to interact with the environment through multiple senses. Our brains and bodies begin to experience the virtual environment as real. ROLL CALL | Recent headlines have been filled with stories and images of parents being separated from their children by the U.S. government. This is not what our country represents. WASHINGTON POST | When I retired from the U.S. Senate in 2007 as its majority leader, my parting words were a prayer for my colleagues to rise above the passions of the moment and protect the institution as a bulwark for our country’s enduring values. The Senate I served in was not devoid of partisanship, nor should it be, but my hope was that patriotism would always take priority over party. The Hill | Our health-care system can be overwhelming for those of us in the best of health. This is especially true of those living with serious and life-threatening illnesses, such as cancer or heart disease — who are juggling multiple doctors, diagnoses, treatment regimens and social stressors. Patients cycle in and out of hospitals and nursing facilities, yet 80 percent say they would rather be at home as they approach the end-of-life. Compared to other nations, U.S. health care providers rely more heavily on medical services and procedures than providing less costly services that can help patients remain more independent and at home, but that is beginning to change. States like Tennessee are beginning to recognize the importance of improving care for patients with advanced illness. Last month the Tennessee general assembly passed a law establishing the Palliative Care and Quality of Life Advisory Council, a recommendation of a state-level task force earlier this year. Forbes | I first met the virus as a young surgical resident in training. I read the initial 1981 report of five people in California who died of a mysterious, unnamed disease. The virus outsmarted and outran us. The first year, we watched helplessly as a few hundred people died. The next year, a few thousand, then a hundred thousand, then a million. And eventually three million people dying every year, that’s more people than died in the entire Korean and Vietnam Wars combined, every year. For each of the last 46 years, Uwe Reinhardt touched me like a father, a brother, a son, a friend. He walked by my side on every leg of my journey and supported me at every major turning point. These are the remarks I gave at his memorial service at Princeton on April 21 and shared with colleagues via LinkedIn. Fall 1971. My first exam at Princeton. It was the final exam for Uwe’s Corporate Finance class. The exam was a single assignment. I’m Bill Frist and Uwe is my mentor. For each of the last 46 years, he touched me like a father, a brother, a son, a friend. He walked by my side on every leg of my journey and supported me at every major turning point. My last heart transplant … he was with me, in scrubs, three feet away, all night, until 4 am. My first date with Tracy, my wife … he and May lovingly holding hands next to us at Nashville’s Bluebird Café (a songwriter haven of country music), Uwe tapping out the rhythm and knowing the words to every song. When I was in the Senate, he expertly testified before my Senate committees. After I left the Senate he, the master teacher, taught me how to teach — as we co-led a course for two semesters at the Wilson School across the street. We spoke at scores of conventions shoulder to shoulder. We traveled to South Africa to watch the World Cup. We talked under the stars, beneath the towering California redwoods, and around blazing campfires with our Bohemian Grove camp mates, who loved him so much. What aspect of life did Uwe not love? The words: inquisitive, joyful, wanting to know everything, music, kind, common ground. These are the words and the images you will hear again and again in this service — because they are the space that Uwe Reinhardt created for us. His teaching lives with us. Uwe was an Honorary Class Member of our class of ‘74 (as well as ‘83, ‘95, 2000). Fellow classmate Matt Singleton laughs when he recalls how Uwe, in his lecture on the “Production possibility frontier in a world of finite resources,” replaces the classical guns versus butter with, yes, marijuana versus beer. Uwe loved his family. Dirk, Mark and Kara would be weaved into almost every conversation. And there literally was not a talk or a speech I can remember that did not have May the central character — highlighted with unabashed affection and love and wit and admiration and respect. Uwe taught and lived with a powerful sense of justice. His favorite class we taught together on health policy was the one on ethical decision making. He taught accounting as a class on national morals. He consciously transformed raw data into moral imperatives. He is, as Drew Altman of the Kaiser Family Foundation said, “the moral compass for American health care.” He attributed this sense of justice to growing up poor in a tool shed without electricity, water or money — but secure in that in Germany he and his mother had health insurance just like everyone else. A nation’s health system should reflect the values of its peoples, he would always remind us. Uwe imaginatively captured the minds and hearts of generations of students and friends. His content was economics and policy. His style was wit and justice. His engagement was charisma and humility. His gift to each of us is creation of a “forever space,” a space that he totally occupies, a space that is with each of us today, in this chapel, a space next to our hearts that we carry with us forever. That beautiful space inspires us each day, to do good … and to make a better world for generations to come. TEDMED | A life-changing story has been missed by the media and the general public. But it will be highlighted in the history books in future generations. Read more at the TEDMED blog. Watch my TEDMED talk. The Tennessean | Operating on a heart — opening the chest cavity, sawing through the breastbone, placing the patient on heart-lung bypass, and finally cutting into the body’s most vital muscle — is always the last resort. As heart surgeons, we tell our patients they can avoid such drastic surgery by acting to prevent heart disease. 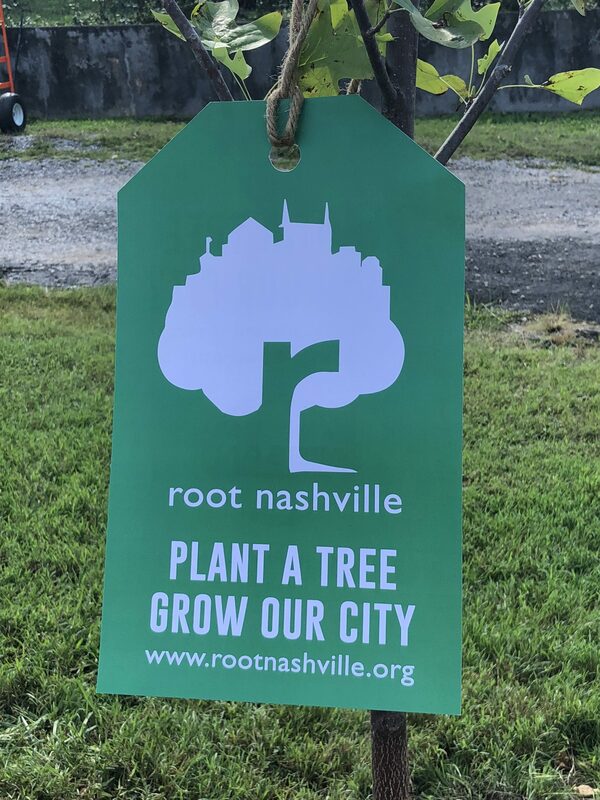 If Nashville’s roadways were my patient’s arteries, I’d tell her there are still preventive steps to take — but we need to act now. The alternative is to die of a heart attack or at best need painful surgery later. Investing in a transit plan today is our preventive medicine. But if we vote down the transit plan on May 1, we are headed for total gridlock — the equivalent of a heart attack — and we will never be quite the same. FORBES | Today the United States health care system is very sick. We have been debating health care policy fixes in America for decades but much of that time our public discussion has focused on unattainable all-or-nothing solutions. Such is the case today. With each side focused solely on their partisan version of the “cure,” we’ve lost focus on the patient. We no longer talk about health care in terms of real Americans’ daily lives, and instead approach the issue as a litmus test of a politician’s fidelity to political party and party warfare. Meanwhile, too many Americans continue to get sick without ready access to quality care. The medical bills are exorbitant, threatening financial ruin for too many families. Wednesday, January 31: We begin the day asking, “Can a program uniting Health with Nature have a synergistic impact on wellbeing?” And further, is that impact measurable and scalable? I’m here on behalf of Hope Through Healing Hands to learn the answer. We are in the bush. We are remote, as remote as you can get in Tanzania… two bumpy, bush-plane rides west from Arusha. Obviously no cell coverage or roads. Our camp on the lake is then an hour and a half boat ride from the dirt airstrip, south on Lake Tanganyka (the world’s longest and second deepest lake). 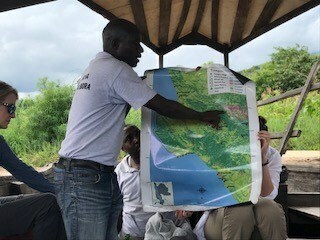 We are here to explore a unique “experiment” program that tests the hypothesis that a specific health program integrated inextricably with a specific nature/conservation program can have a meaningful (and ultimately scalable) impact on an individual’s and community’s health and wellbeing. 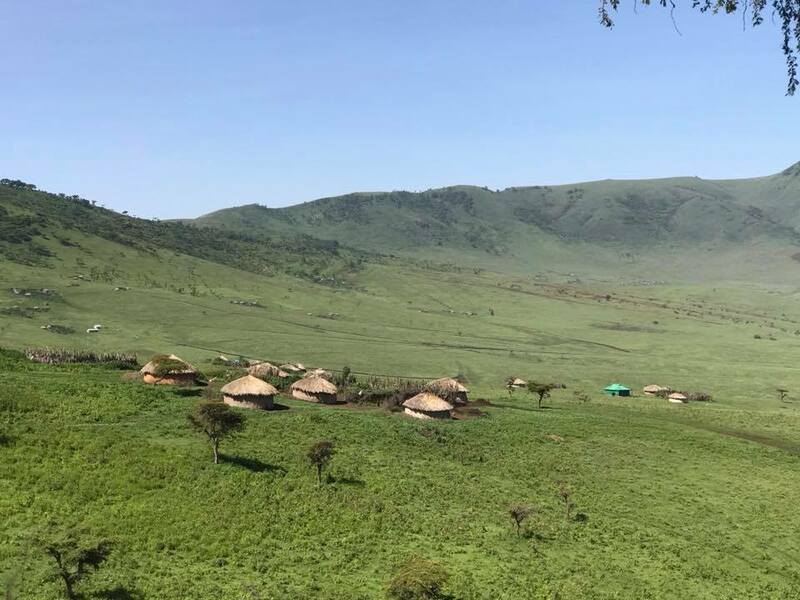 The Nature Conservancy and Pathfinder International sponsor the program together; I’m gathering best practices that Hope Through Healing Hands can apply. Health Clinic: a minimal, primitive infrastructure. 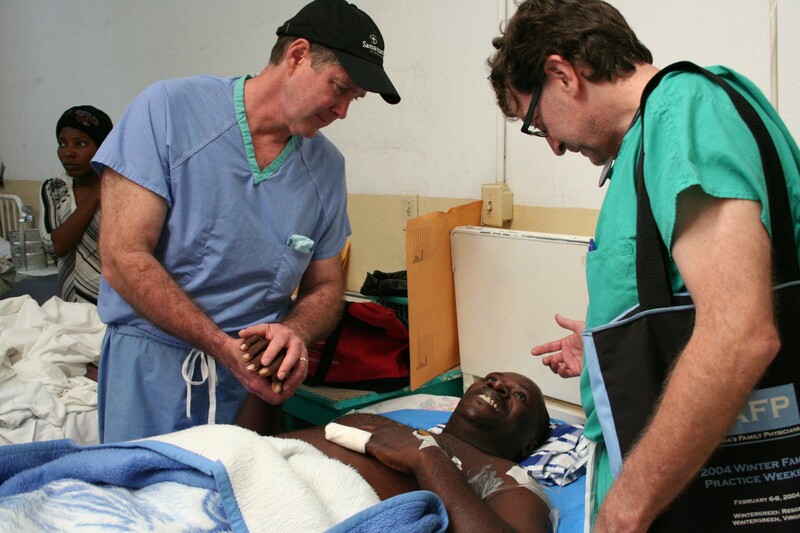 The nearest “hospital” — more advanced but still only basic — is a 6-hour boat ride away. The community health worker program: A team of impressive volunteers focuses on family planning. Pathfinder International’s major focus is family planning. 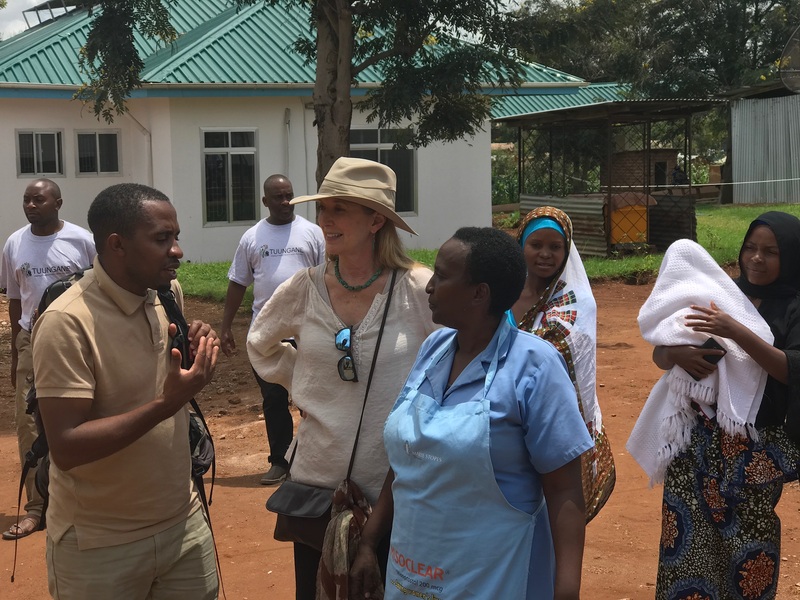 Their focus on decreasing maternal deaths and healthy timing and spacing of pregnancies aligns with our work at Hope Through Healing Hands. The “model home” initiatives: Introducing improved, efficient mud stoves to conserve the forests, lessen inhalation of smoke (respiratory disease), and reduce serious burn and death by fire. Equal partnership and full integration of two NGOs operating as a single program. Of the 10 or so team members wearing the single logo “Tuungane … creating a healthy future for people and nature” shirts, I could not tell who represented TNC and who represented PI. Community health workers (volunteers from the community and jointly trained by both organizations) served the entry point for all communication and potential change in behavior and values. All messaging is delivered and accepted through this powerful funnel of trust. Outcomes. For health and well-being: Maternal deaths fell from 16 to 7 to 4 over the last two years! 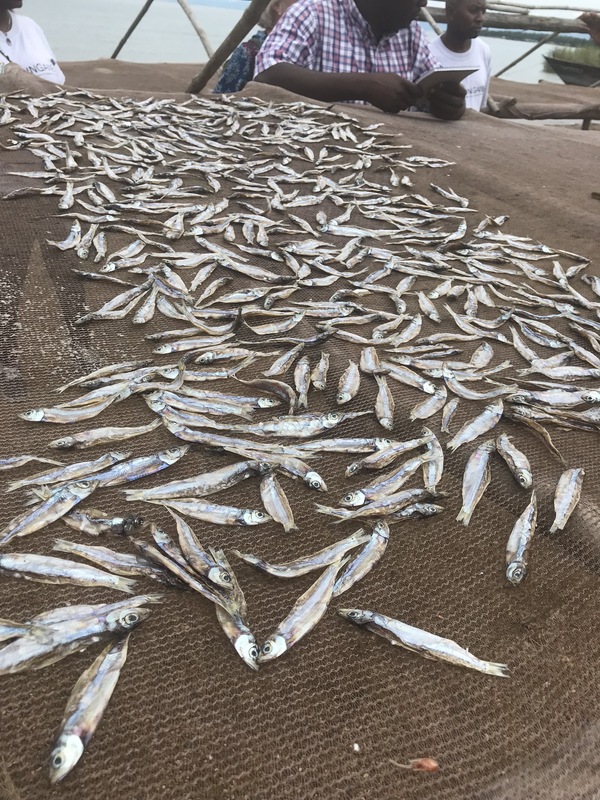 For nature, fish—the most valuable resource for the economy—are replenished as regulations are designed for sustainability and enforced. Forests are protected. STAT | The secretary of HHS is one of the most important Cabinet positions in the federal government. The department has a budget of over $1 trillion and 70,000 employees, and its programs touch nearly every American. With such an extensive reach, the HHS secretary must be experienced managing complex and large organizations; possess broad knowledge across an array of issues; and demonstrate a record of solving difficult problems. A person like this is hard to find, and the search is made even more difficult by the hyper-partisan nature of today’s politics, in which both parties too often view the other with deep suspicion. Alex Azar’s nomination as the next HHS secretary meets this high bar. LINKED IN | December 3rd is a historic day in modern medical history – this year marked the 50th anniversary of the world’s first heart transplant. Once considered the stuff of science fiction, this miraculous procedure now saves thousands of lives each year, with 3,191 heart transplants performed in the United States in 2016 alone. The medical miracle of heart transplantation has affected the world for so much the better. More personally, it has dramatically influenced my own journey as a clinician, medical scientist, and U.S. Senator with life lessons, and helped shape current and future holistic models of the continuum of patient care delivery. One of the key metrics is funding, and I’m proud to report that – after many years of stagnant or declining funding – Tennessee has risen in the rankings, spending $6.2 million on tobacco prevention and cessation for 2018. THE HILL | The U.S. President’s Emergency Plan for AIDS Relief (PEPFAR) is one of the most successful humanitarian relief efforts ever undertaken. It is directed at one of the world’s most daunting public health problems. 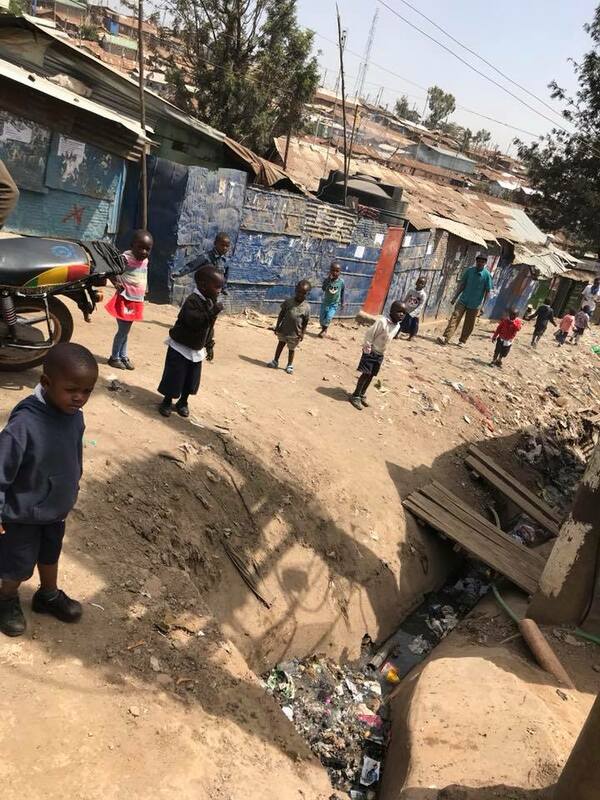 AIDS strikes people in the prime of their lives, shatters families and communities, orphans children, and threatens the ability of nations to develop. Bipartisan, U.S.-led efforts to address the epidemic, supported by other donor nations and the affected countries themselves, have brought health, and hope, to tens of millions of men, women and children facing AIDS. Millions are alive today who would have certainly succumbed to the disease; AIDS-related deaths have fallen by 48 percent since the peak in 2005. American leadership, generosity and the expertise of many on the ground in countries impacted by AIDS have achieved what few even imagined was possible when PEPFAR was created. DEVEX | A decade and a half ago, we came together to bridge the political divide and address one of history’s worst public health crises. In 2002, 3.1 million people worldwide died of AIDS-related causes and 11 million children in sub-Saharan Africa had lost one or more parents to the disease. The AIDS epidemic was only getting worse; immediate action was necessary. As a progressive, Democratic congresswoman from the San Francisco Bay Area and a Republican senator from Tennessee, we were an odd pairing to tackle this emergency. But we knew that if we could find common ground, countless lives would be saved. So together, along with President George W. Bush and HIV/AIDS champions on both sides of the aisle, we created the President’s Emergency Plan for AIDS Relief, or PEPFAR, the largest legislative response to a single disease in history. LINKED IN | One month after Christmas, in 1987, my surgical team and I prepared for Tennessee’s first heart-lung transplant. A determined mother, desperate to live, was flying to Tennessee to receive the heart and lungs from a young woman in Nashville whose own life had ended too soon. It was a bold step for our patient, the surgical team, and the brand new Multi-Organ Transplant Center at Vanderbilt University. I had just left Stanford to move home to Nashville and start the Multi-Organ Transplant Center at Vanderbilt University Medical Center (VUMC), with the goal of creating a world-class transplant program. At that time, heart-lung transplants were still quite rare; fewer than 100 had been performed worldwide. It was a challenging operation that would give even the most experienced surgeon pause. Remove all the organs between the neck and the diaphragm, leaving the chest cavity bare. Transplant a donor heart and lungs. Put everything back together. The long-term prognosis of transplanted lungs was unknown. It was a nascent field. The procedure was still considered experimental in 1987, and most insurers would not cover it. So before we could take on a heart-lung patient, several things needed to happen. First, I needed a guarantee to finance the operation. The cost of transplantation, which often totaled $100,000 or more, was one of the big social and ethical issues confronting the field at that time. We didn’t want this life-saving treatment to be available only to the very wealthy, but without insurance covering the procedure hospital systems struggled with how to absorb the hefty cost. I had already left one program at Massachusetts General when they decided (mistakenly and shortsightedly I believed) in 1980 not to pursue heart transplantation because of the price tag. In starting the multi-organ transplant center, Vanderbilt agreed to open its doors to the patients in greatest need, not just those who could afford to pay. Eventually our center would need to pay its own way, but during those early years when insurers failed to cover the procedure – we would. SALT LAKE TRIBUNE |The challenges we face in the world today are different but no less severe: Chinese military activities in South China Sea, Russian aggression in Ukraine, Cyber-attacks, North Korean nuclear ambitions. But they also include softer threats ranging from unprecedented food insecurity and famines to mass migration and refugee flows to the threats of violent extremism and pandemic disease. Yet the solution to these problems still depends in large part on strong and clear U.S. leadership. And while U.S. foreign assistance is often criticized for being a large and ineffective part of the federal budget, this could not be further from the truth. 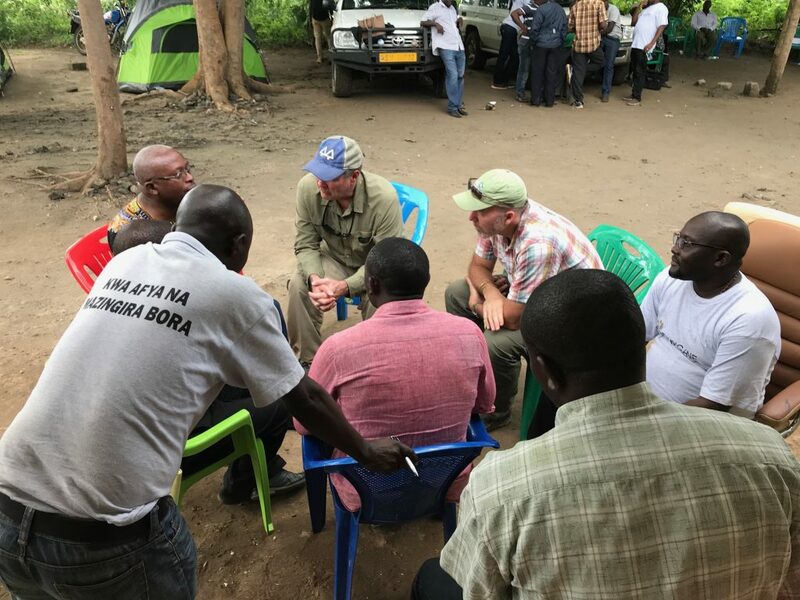 In recent years, the United States has led an unprecedented and incredibly successful global effort to combat global poverty and disease through bipartisan initiatives such as the President’s Emergency Plan for AIDS Relief (PEPFAR), the President’s Malaria Initiative (PMI) and the Feed the Future global food security program. 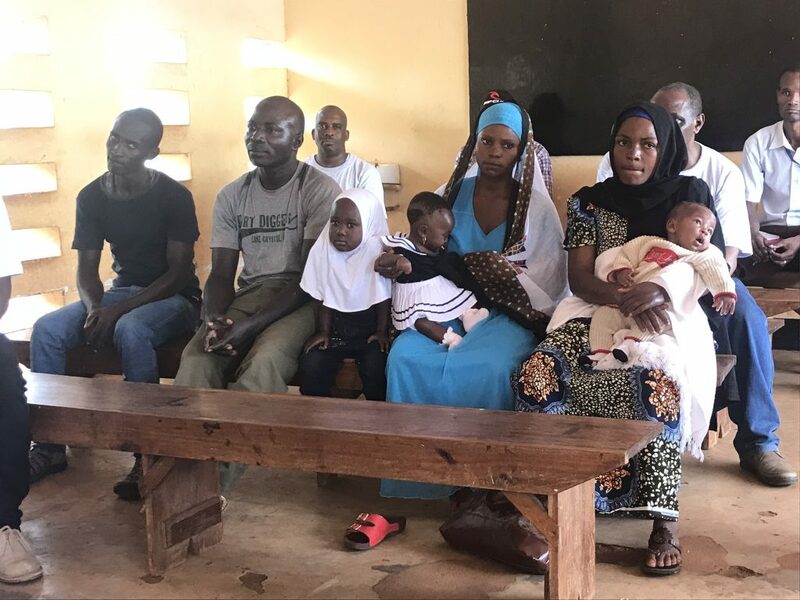 These programs are representative of the U.S. leadership that has helped reduce the deaths of mothers and children under five worldwide by more than half since 1990. A few other U.S.-led success stories include providing HIV/AIDS treatment to more than 11.5 million Africans who otherwise faced a death sentence, reducing malaria incidence by more than 75 percent in the hardest hit countries, reducing global hunger and malnutrition by nearly 30 percent since 2000, and expanding access to life-saving vaccines to more than 500 million children around the world. 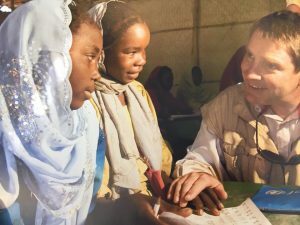 The US has led these initiatives that have saved tens of millions of lives with a foreign assistance investment that represents less than 1 percent of the US federal budget. KNOXVILLE NEWS SENTINEL | Nearly 15 years ago, Congress passed a historic, bipartisan bill that has since provided life-saving HIV/AIDS treatment to nearly 12 million people and reversed the spread of this devastating disease worldwide. 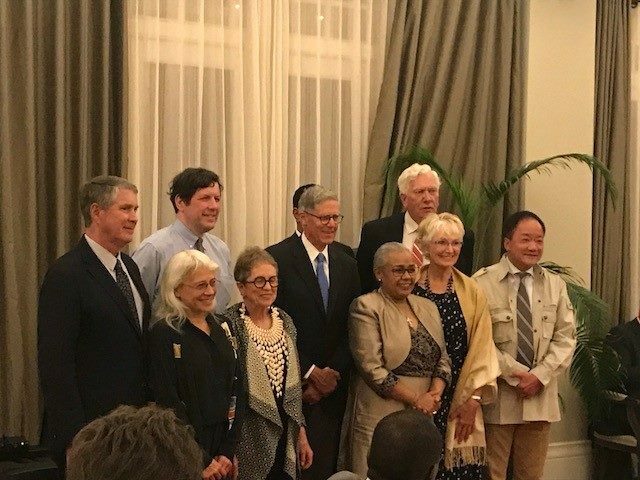 The President’s Emergency Plan for Aids Relief, better known today as PEPFAR, has been heralded as a model for how both political parties can come together for a cause we can all support – saving lives around the globe. The bill’s passage also marked a critical step in ending preventable deaths in foreign nations and demonstrated America’s continued moral leadership on the world stage. Now we have a chance to pass another bipartisan bill that will further America’s commitment to the least among us and save the lives of millions of mothers and kids. The Reach Every Mother and Child Act, or Reach Act, was recently reintroduced in the Senate and will be introduced soon in the House. It focuses on expanding proven solutions to end preventable deaths of mothers and children within a generation. 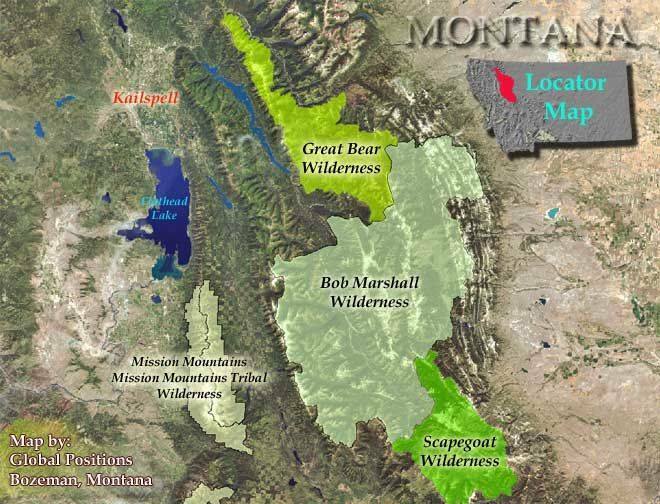 Notes From The Road | The Bob Marshall Wilderness Complex consists of three wilderness areas in Montana totaling over 1.5 million acres. Located in the northern Rocky Mountains along the Continental Divide, the region is as primitive as any found in the United States outside of Alaska. 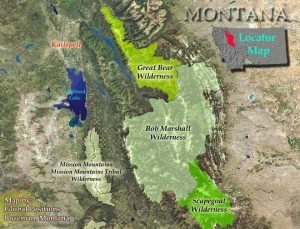 It’s also diverse, encompassing the dry and open Rocky Mountain Front Range on the east, and the lush and heavily timbered Swan Range and Flathead Range on the west. 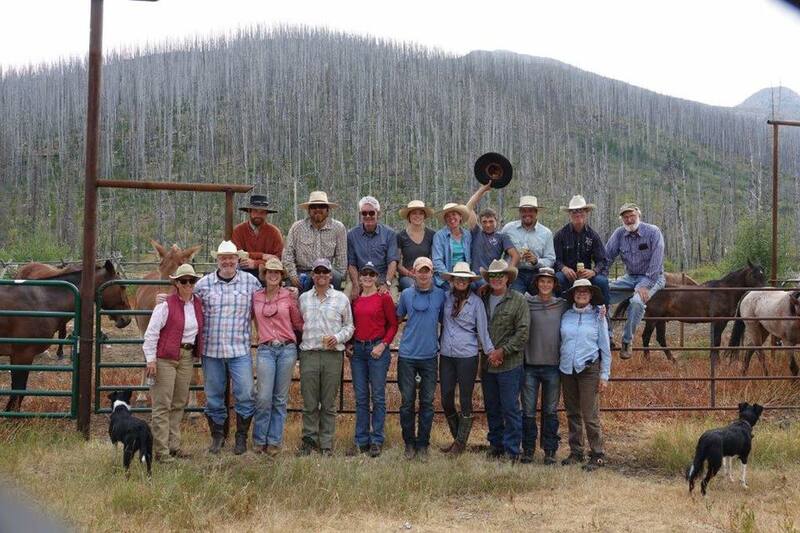 As a result, it is the most ecologically complete mountain wilderness in the country. Every species of mammal indigenous to the Northern Rockies still lives in this area and adjacent Glacier National Park, except bison and woodland caribou. 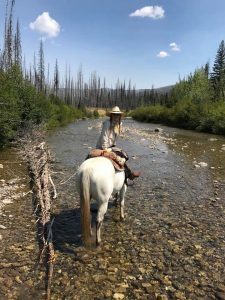 Huge herds of elk, bighorn sheep, and mountain goat roam the region’s rugged peaks, big river valleys, large meadows, and vast coniferous forests. The Complex is prime Grizzly bear habitat; the population density is higher there than anywhere else in the lower 48 states. Tracy and I had the opportunity to spend nine days in this vast national treasure last month, confirming for me—yet again—the inestimable value of our country’s wild lands. We had no connectivity while we were there, so I jotted down notes at night and shared them (and pictures) when we returned. Day 1. Tracy and I showed up at Lazy P Ranch on edge of the Bob Marshall Wilderness (the 1.5-million-acre crown jewel of the American wilderness system) for all-participant dinner, followed by an enlightening discussion of conservation of public lands, and critical multi-generational role of organizations such as The Wilderness Society and The Nature Conservancy. Conversation quickly turned to those special, local individuals who actually make possible the rich experiences and journeys into pure, untouched nature, like the ranges and basins we will explore over the next 8 days. Dusty, Danelle, Gene and others have led the way. For the first time in 29 years (transplant patients, political constituents, business), I turn off ALL electronic contact. Step one to achieve connection to nature and real world around us. Day 2. Met Pat and Nickel early in this morning. They are strong, experienced, and loyal. They can be trusted through easy and tough times. They are the pros. They are the two horses for Tracy and me for the next seven days. And we met the 13 huge pack mules who will dependably carry our food, tents, supplies and everything else for the next 8 days. We set off on Route Creek Pass headed to Wrong Creek camp (13 miles). We soon saw our first bear. Alternating between woods and open spaces built our anticipation for the big climbs ahead. The power and grace of the mules working in harmony was the most amazing! We are beginning to taste the wildness and feel the grandeur. A little bit behind our motivation for the journey is caught in the words of American naturalist John Burroughs, “I go to nature to be soothed and healed, and to have my senses put in order.” What a rich inheritance from past generations are these vast and spectacular publicly (you and me and all of us) owned lands. Day 3. Today we get closer in touch with the wild spaces. Big hike and a little fishing; Tracy’s hat becomes more colorful as we traverse meadows, scale hillsides and descend to and through the crystal clear creeks. Fresh drinking water from the creeks. Sore just a bit. Long rides on horseback use tiny muscles all over the body (little ones that had no names in medical school but still ache when taken to their limits!). Mules and horses were “belled” and allowed to roam freely for forage and grazing when not working! The clanging bells in the distance become a familiar, soothing melody. Day 4. Out of camp at 9:30 after packing tents, first mountain goats observed high up to the left along the Chinese Wall (Swep said one was three–legged, which kept us looking). The Chinese Wall is a thousand-foot high scarp of limestone that stretches for a dozen miles—a dramatic manifestation of the Continental Divide that we paralleled on our journey. The Wall is the rocky playground for these agile goats. Leisurely lunch on Pendleton blanket Tracy wisely brought and tied daily to her saddle with rain gear, as we marveled at the long, continuous, nose to tail, pack of muscular mules calmly yet determinedly marching by us. Further north, we come to the limestone and red shale North Wall, about 10 miles long and seemingly even more primitive. Our trail followed the foot of this towering rampart, its starkness contrasting to the wildflowers and berries and grasses in meadows at the base of the towering cliff. I really need to learn the names and more about these berries, and flowers, and their lifecycles. Highlight for Tracy and me: after a short hike, bravely swimming (only about 10 strokes because so cold!) in gorgeous, high mountain lake, Lake Levale, set against the backdrop of the rugged North Wall (seems like huge human faces carved into its side) and blue sky studded with journeying cumulus clouds. Arctic grayling fish were surfacing continuously, making ripples across the otherwise smooth turquoise waters. The spiritual experience is beginning to settle in. You see why the wilderness is known as Nature’s Cathedral. Tent positioned a little too much downhill last night which continued to ball up each of us at the foot of the tent all night. Hard to scoot uphill every hour in a sleeping bag. Will be more careful in choosing a flatter spot – even a few degrees matters! It’s been four days without internet, TV, smartphone. The inner self is beginning to merge with the outer without all the clutter of oncoming! As Ralph Waldo Emerson wrote: “The lover of nature is he whose inward and outward senses are still truly adjusted to each other.” We, now 4 days in the wilderness, begin to feel this adjustment. We need to make sure this environment of pure nature is preserved for generations to come. Day 5. We are a long, long way from civilization! Solitude and appreciation and humility as we connect with our horses and full blown nature. Today we pass from deep gladed forests to open, steep avalanche slopes of rocks devoid of trees. We feel the raw power of nature in these contrasts. Most intense feat thus far – traversing Switchback Pass! 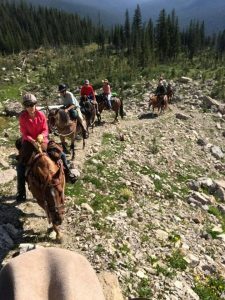 Actually we just hung on to their mane leaning as far forward as possible as our powerful horses boldly climbed the steepest and most rugged of the switchbacks, up the sheer mountain along the North Wall Trail. Talk about humbling! As we were forewarned, today was the day we ran into a patch of bees, the horses anxiously reacting as you might expect with swarms of stinging bees, but all anticipated and taken in stride. Just keep moving when the going gets challenging! Swam in Trilobite lake which felt good and cleansing, with a belled mule joining for a drink at the edge, looking on nonchalantly. Lots of berries along the trail today. Tracy and I share together the reverence for these awe-inspiring wild places. “Look deep into nature, and then you will understand everything better” explained Albert Einstein. Day 6. “Breakfast” – every morning at 7 am, the familiar piercing shout seems to come just a little too soon and way too commanding. We must be totally packed and ready to go before that call. 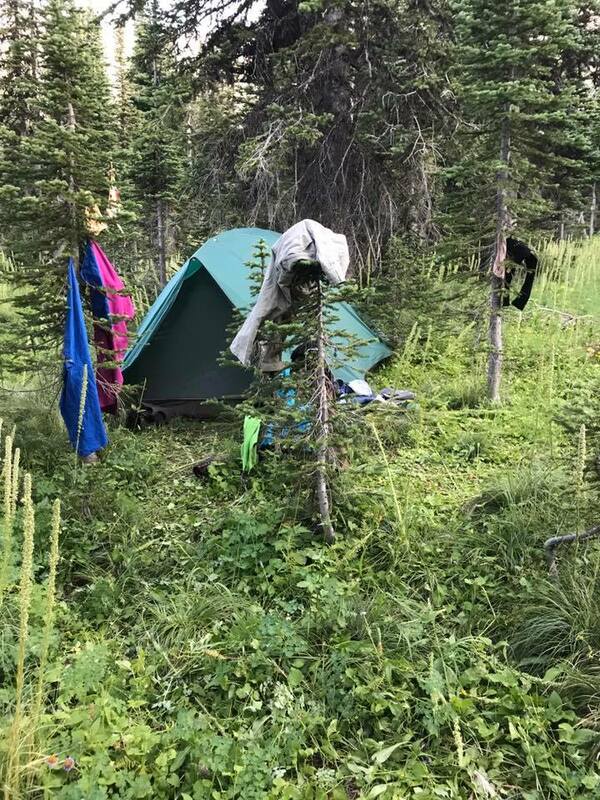 But after breakfast we have the easy part, take down the tents, while the crew pack, tie, lift and secure two heavy, heavy (as much as 200 pounds each) manties to every mule. Performed, it seemed, like a smooth surgical procedure – though so much more muscular. Not to mix metaphors, but the whole morning prep for departure of 16 horses and 13 mules is like at grand symphony in the wilderness. I know tying and knots — but only surgical knots. Nothing about real knots. The trip was full of “learnings” and today was knot tying. As others climbed peaks Tracy and I found solitude. Amidst breathtaking mountains and clear clean air. No roads, no devices. Just embracing nature and sounds of breezes, bumble bees, and butterflies (really). Relaxing, calming, centering. Clutter falls away. Thoughts seem a little clearer. “We need the tonic of wilderness,” reflected Thoreau. We should actively protect this connection to nature so our great grandchildren (and theirs) can experience. These public lands are ours and we are their custodian. Once wilderness taken away it can never be regained. It is lost forever. Too many words from Washington today suggest that these public lands are at risk. We need to be smarter. Day 7. Ten miles total ride today riding to Basin Creek. Half way we came to Gooseberry cabin, literally the only man-made structure we have seen all week. We are immersed in pure, unadulterated wilderness. No manifestations of man, road or structure anywhere, and we leave it just that way. Tracy and I found a huge shade tree for our packed lunch that we carried each day in our horn bags (along with a lot of water) and we both nap lazily. We had been advised to bring the best rain gear we could buy, but so far all sun. But at around 8 pm the clouds darkened. The saddles were covered and we prepared for rain. Off to our tents for cover, pulling all our gear inside for protection, where for the next hour we were enchanted and entertained by a huge thunderstorm with repeating flashes of lightening, heavy, recurrent rolls of thunder all around us, wind lifting our tent flies, and rain spattering against our tents. The raw power of nature speaking. Then suddenly all silent. Perfectly quiet. Day 8. Sun River Pass Trail. Trace and I hang around camp today as others off to fish and hike. Carson had given me the best pointers on chopping wood efficiently yesterday and safely (he started by saying my sandals were not safe, my pack boots much safer), so after everyone was out of camp, I chop as much wood as I could, not for a campfire because it was too dry for that, but just because I could. Something in nature just wants you be a part. As Churchill said, “Nature will not be admired by proxy.” I stack the wood neatly (and vertically to make it seem like a lot) as I go to measure my progress. Tracy chops so much better than me! Off for a hike up the trail we came in on and then through a flowing meadow to a split in the crystal clear creek for lunch – and taking the opportunity to lie on the bank on our backs to rinse our hair (without having to get all the way in – cold water!). 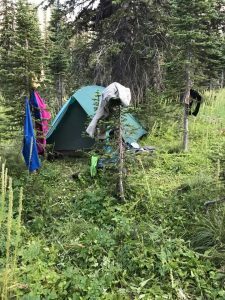 A huge, fire in 1988 left miles and miles of the landscape with an otherworldly feel – only the charred trunks of the lodgepole pine were left standing, void of all branches or greenery. Undergrowth of aspen and pine are just beginning. Day 9. 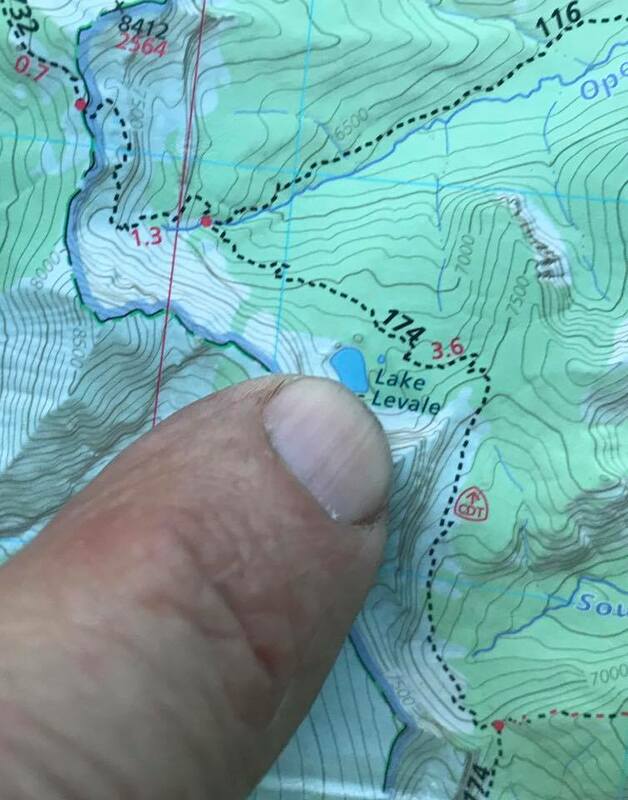 Today is our last day on the trail – 14 miles. 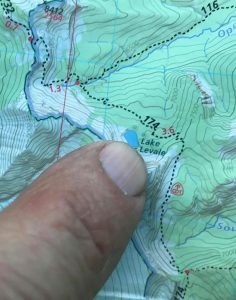 Billed as an “easy 14” but it seems a bit tougher, maybe because we “smelled the barn.” In and out of the woods, meadows, valleys, and hills, all is gorgeous. No grizzly bears (yes big tracks!) or mountain lions, but mule deer are common. Even Luke, who is 14, said on a scale of 0-15, that his aches were a “4”. Curiously but nonchalantly, he remarked agreed, thinking I was about a 7”. We pull up at a coral, the terminus of our journey. Beef jerky, crackers, cold drinks awaited, as we loaded our saddles in trailers. How could it be over? We are just now becoming one with nature. We are filled with more understanding and more humility and more fulfillment. FORBES | Why would someone give up a career as a full-time surgeon to become an elected official? Surgery certainly provided an avenue for helping others, but it required focusing on one patient at a time. Each time the door to the operating room closed, I never forgot that a patient’s loved ones were sitting just outside, anxiously waiting for news. I wondered if there was a way to support all of these people — both in times of crisis, and in times of security. WASHINGTON POST | At a meeting in California this spring, we sat down with a number of insurance company chief executives who are major participants in the Affordable Care Act exchanges. They asked us to carry back a message to Washington: Put partisanship aside and end federal uncertainty about support for the ACA; otherwise, they will end up setting premiums higher than necessary or withdrawing from markets across the country. With only weeks before the exchanges open for business again, Washington has one more chance to take clear action to bring down premiums and help millions of American families. We developed five recommendations that could stabilize the individual health insurance market. THE TENNESSEAN | At Carpenters Middle School in Blount County, exercise and reading go hand in hand. Nearly 200 students participate in the “Pedal Power” program, spending 20 minutes a day reading a book they select while riding a recumbent bike. Blount County’s program is not an outlier. We are increasingly learning that students’ overall well-being and their academic achievement are intrinsically linked. In our experiences—as a physician and as an educator who has taught at the high school and college level — we both have seen firsthand that good health helps our youth prosper. FORBES | Eight years ago, former Democratic Senator John Breaux and I wrote: “Given the acrimony that’s developed over efforts to reform our nation’s health insurance system, many Americans wonder whether true bipartisan agreement on health reform can ever be possible. In short, it can.” Back then, we watched contentious debate over what came to be known as Obamacare, and we never saw bipartisanship materialize. But in 2003 we both participated in creating and enacting the bipartisan Medicare Modernization Act that established the enormously successful Medicare Part D. Bipartisanship was alive then. We missed an opportunity eight years ago, but over the next few weeks we have another prime chance. The healthcare (and health) of 11 million Americans hangs in the balance. This may sound like a small portion of America’s insured population, and as a percentage it is, but these are all people we know. The 6 percent of Americans who buy their insurance on the individual market are the small business people, contract workers, entrepreneurs, musicians, stay-at-home parents, job seekers, and the millions of Americans who can’t receive coverage through their employers. They are Republicans, Democrats, and Independents. Trump supporters and Hillary voters. And their ability to purchase coverage on the exchanges is in jeopardy, as mixed signals from Congress and the Administration have left insurers scrambling to decide whether to hike already costly premiums or pull out entirely—triggering the beginnings of collapse in some regions. 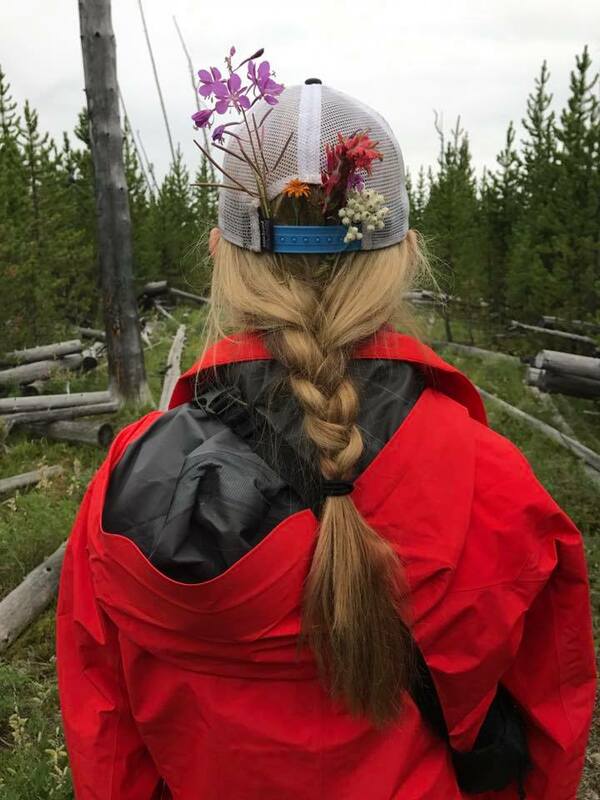 FORBES | Have you ever wondered how experiencing nature can improve your health and your life? Increasingly, healthcare and public health professionals are recognizing that the social determinants of health—including where we’re born, live, work, play and age—collectively have a far greater impact on our health outcomes than the healthcare delivery system. It’s estimatedthat healthcare services account for just 10% of longevity, while social and environmental factors account for twice that at 20%, genetics 30%, and individual behaviors an estimated 40% (Schroeder, NEJM, 2007). Our surroundings and how they influence our choices form the foundation for a healthy lifestyle. HEALTH AFFAIRS BLOG | While federal policy makers are undertaking controversial and divisive debates over the future of the Affordable Care Act, Republicans and Democrats have had a good track record of working together to improve health care delivery and payment frameworks. Most recently, the bipartisan Medicare Access and CHIP Reauthorization Act of 2015 reformed Medicare’s physician payment system to better link payment to quality, as well as incentivize participation in models of care outside of the traditional fee-for-service system. These alternative payment models continue a history of bipartisan work in delivery system reform by shifting away from fee-for-service (FFS) and toward a more coordinated, efficient system of care. The shared goal of ensuring high-quality, high-performance, and affordable health care presents a unique opportunity for further bipartisan agreement. Building upon this goal, we should also work to advance a more patient- and family-centered approach to delivering care, especially to those with complex, high-cost health care needs. A good place to start, and an area where policy makers have already placed an increased focus, is on developing solutions within federal health programs to improve outcomes for individuals with multiple chronic conditions and functional limitations. People with multiple chronic conditions typically use more services, such as emergency department visits, hospitalizations, and eventual need for long-term services and support, compared to those without multiple chronic conditions. For those with complex health needs and functional impairment, health care expenditures averaged $21,000 annually, more than four times the average for all US adults. This spending trajectory is unsustainable for both patients’ pocketbooks and the health care system as a whole, and the care they receive is often fragmented and confusing. There’s a lot of uncertainty in healthcare today including changes to the Affordable Care Act and changes at the Centers for Medicare and Medicaid Services. As healthcare professionals, we hope we are moving to a world of alternative payment models that will be focused on quality of care, not quantity of care. Palliative medicine, whether practiced by a generalist or a specialist, is an imperative and integral part of the care system. It matters to patients to be able to have frank and honest discussions with their providers about what will happen to them as their illness progresses and to be assured adequate management of symptoms to support their desired quality of life. But regardless of what happens in Washington, we are not powerless. This week is dedicated to making our own healthcare decisions, taking back the power for how we want our care to progress and what we want the end of our lives to look like. Discussions about end of life care are no one’s favorite subject, but in the fog of grief, those conversations become priceless. This week is dedicated to National Healthcare Decisions, and we urge you to broach the uncomfortable subject, to give your family a gift they may not need today but will most certainly treasure later. Educate yourself about the decisions that you may need to make about healthcare in the future. Study and understand the risks and benefits of cardiopulmonary resuscitation, the use of ventilators, artificial hydration and nutrition, and comfort care. If you have any questions, make an appointment to discuss your end of life goals with your healthcare provider. Engage a person you trust to be your surrogate decision maker in case you are not able to make medical decisions at any point in the future. The person you appoint to be your proxy for healthcare must to be informed of your personal values and desires for the type of healthcare you want to receive if you are ever unable to communicate your decisions on your own. Ease the burden on your loved ones by voicing your healthcare preferences in writing. Many resources for completing advanced directives can be found online. Make sure you adhere to your state government’s guidelines. Then, provide a copy of your documents that express your healthcare decisions to your medical providers and the appropriate people in your relationship network. Review your plan each year, or as your health status changes. Make updates and share them as necessary. On this National Healthcare Decisions Day—today—take control of your health future. Spend time thinking about your future needs and share your decisions with your family and your healthcare providers. Consider this an investment in your peace and theirs. Gary W. Dodd, ANP-BC, M.S.N, M.Div., is a Board-Certified Adult Nurse Practitioner with Aspire Healthcare promoting holistic care. THE TENNESSEAN | Earth Day matters — to you and your health. Earth Day was established in 1970 to make us think, for at least one day, about the health of our environment. We submit that every day should be Earth Day. Not just for the health of nature, but for your health and well-being. When 90 percent of a person’s health is determined by something other than doctors and hospitals, we should naturally be spending some time understanding those other determinants. And the immediate environment in which we live is chief among them. 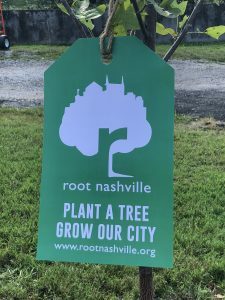 Community well-being is rooted in the environmental health of the city, and we are not the healthiest version of ourselves. FORBES | Health is more than healthcare. Smart reform looks beyond the current conversation of repeal and replace. It must include an active and empowered consumer making choices that matter within a modern, connected, knowledge-driven system. THE TENNESSEAN | If you were asked to name the No. 1 cause of death in women in Davidson County, what would you say? Cardiovascular disease kills one out of every three women in the United States. In Davidson County, it is women’s number one killer. For every one woman who dies of breast cancer, more than eight die from heart disease and stroke. And even more are at risk: 22 percent of adults smoke; nearly one-third are obese; one in four are physically inactive; and more than 33 percent report having high blood pressure. CHRISTIANITY TODAY | For the past two decades, we have had a front-row seat in the bipartisan movement to end worldwide preventable, treatable diseases like AIDS, tuberculosis, and malaria, and to make poverty history. Since 1990, the world has cut in half maternal and child deaths, infectious diseases, and poverty as well as turned the tide on HIV/AIDS. We have made unprecedented strides in human history. This may be the legacy of our generation as historians analyze what we were able to accomplish worldwide during our lifetime. Central to this legacy, it is worth noting, is the progress led by the United States during the Bush Administration. Millions of mothers, babies, children, and families are alive today thanks to America’s great leadership in the world for health, food security, and education—all at a cost of less than 1 percent of our country’s spending. (Year after year, most Americans estimate that we spend far more than that.) As doctors say, an ounce of prevention is worth a pound of cure. As President Donald Trump seeks to balance the US budget, it has been reported that the administration wants to dramatically cut foreign assistance by as much as 37 percent. Forbes | In the last six weeks, two critical reports have shined a spotlight on Tennessee’s high levels of tobacco use and inadequate prevention efforts. In December, the Campaign for Tobacco-Free Kids and other public health organizations published a report that compared funding for tobacco cessation and prevention in each state, and Tennessee ranked a dismal 45th nationwide. Tobacco-Free Kids noted that Tennessee provided only 1.5% of the CDC recommended $75 million in funding for tobacco cessation, despite receiving over $400 million in revenue from tobacco taxes and a long-standing settlement deal with tobacco companies (known as the Master Settlement Agreement). NEW YORK TIMES | Among global public health advocates, there is a growing concern that President Trump may cut back, or even eliminate, programs that have played a critical role in fighting diseases worldwide. While every administration should strongly review our nation’s overseas commitments, and there are undoubtedly programs that we should cut, I hope he recognizes the success and importance of one in particular: the President’s Emergency Plan for AIDS Relief. Pepfar was created in a moment of crisis: In the late 1990s, H.I.V.-AIDS was the No. 4 killer worldwide, and No. 1 in Africa. 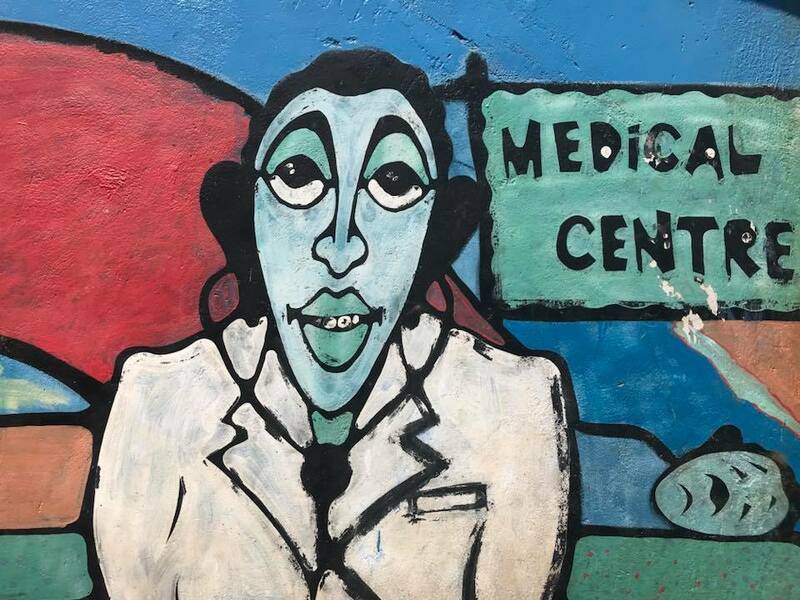 The program aimed to bring reliable, proven measures like antiretroviral drugs, counseling and prevention services to underserved communities around the world — and it worked. Today, Pepfar reaches 11.5 million people with antiretroviral drugs, a 50 percent increase since just 2014. Two million babies with infected mothers have been born H.I.V.-free thanks to Pepfar interventions, and 6.2 million orphans and vulnerable children receive care from the program. TEXAS TRIBUNE | If you become ill and need a doctor tonight at 11, who will you call? What will you do? Texans in Austin, Dallas, or Houston are probably surprised to learn that Texas ranks 47th in the nation in the number of active primary care physicians per capita. Among its 254 counties, 35 have no practicing physician, and 80 have five or fewer, according to research conducted in 2015 by Merritt Hawkins. And 185 counties — more than 70 percent — lack a psychiatrist. The doctor shortage is an issue that impacts most of the state. In recent meetings with state legislators and other public officials, I have emphasized the importance of making telemedicine a priority in the current legislative session. At the start of a new year, we often find ourselves making resolutions to eat healthier and get active (I know I’m one of those people!). But the good news is, America’s interest in healthier foods has become a year-round trend, not just a New Year’s fad. With a new Congress and a new presidential Administration starting on Friday, we have an opportunity to continue to support business-driven successes in incorporating healthier choices into Americans’ diets. The US Senate just voted 94-5 to pass the 21st Century Cures Act. This is an historic moment for American medical innovation and the millions of patients who will benefit. The Cures Act is groundbreaking. Over the 40 years I have been in medicine, there has never been a more exciting time for medical innovation than today. The Senate’s passage of this bill will impact millions of Americans and give a big voice to patients in improving their care. With an estimated 7,000–10,000 known molecular-based diseases without cures, we now have an opportunity to change that trajectory and find new cures and treatments for patients. 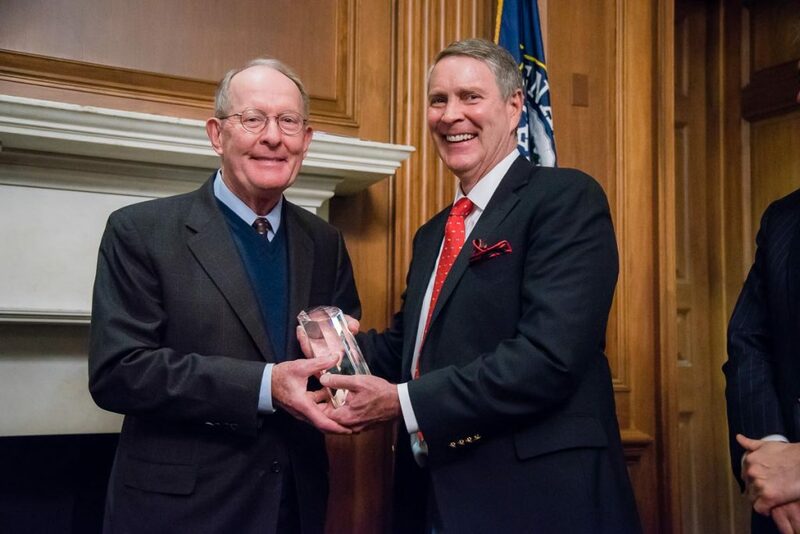 Chairman Lamar Alexander’s vision and steady leadership in spearheading the Senate version through the Health, Education, Labor and Pension Committee was vital to making today possible. I worked with Senator Alexander and the Bipartisan Policy Center to bring in medical perspectives from across the county to develop key pieces of the final legislation, including language to advance regenerative cell therapies that hold promise for restoring vision, repairing hearts, and rebuilding damaged joints. This legislation includes major investments in cancer research, precision medicine, opioid-abuse prevention, and neurological disorders, paired with the streamlining of regulations, that will advance treatments for the millions of Americans still suffering from untreatable illnesses. No other legislation enacted this Congress will do as much good for so many. Its passage today will pave the way for groundbreaking cures that will touch nearly every American family, and demonstrates that Washington can still work together to address the most pressing needs of the American public. Washington, D.C.– Today, Congress put patients first by passing the 21st Century Cures Act – groundbreaking medical innovation and research legislation that will help millions of Americans with life-threatening diseases and their families. The Bipartisan Policy Center applauds Congress for working together to achieve this rare bipartisan compromise. It signals an encouraging moment for the nation that their government can make progress on behalf of the American people. BPC began its medical innovation initiative in 2014 under the leadership of former Senate Majority Leader Bill Frist, M.D., and former Rep. Bart Gordon. The Cures bill reflects many provisions outlined in its July 2015 report Advancing Medical Innovation for a Healthier America: bringing the voice of the patient into the drug development process, increasing the use of real-world evidence and drug development tools to improve the drug development process, advancing precision medicine to tailor treatments for patients, enhancing the FDA’s ability to hire and retain top scientific talent, improving interoperability and increasing regulatory clarity associated with health information technology, and improving the regulation of regenerative cell therapies. HEALTH AFFAIRS | How can Main Street, America, move the needle in a city’s population health and wellbeing? It begins with a solid, organizational structure built for the long term. I fondly call my hometown, Nashville, the “Silicon Valley of Health Services.” With 18 publicly traded national health care companies headquartered here with annual global health care revenues of over $70 billion, our city takes health seriously. One in 10 workers in the Nashville metro area are health care providers, nurses, or health aides. Even more work in the broader health sector, such as health management, financial, and legal roles. We have two outstanding medical schools, six schools of nursing, a dental school, and two schools of pharmacy. Our city is in the business of providing multiple health services to every state in the country. Here is the cruel irony. When you compare us to similar cities, the health of Nashvillians is poor. We smoke at rates higher than Charlotte. We have blood pressure rates that exceed those in Austin. Our obesity rate surpasses Cincinnati’s. Our infant mortality rates are not even competitive. Our babies are more likely to die in their first year of life than in countries like Croatia, Serbia, and Qatar. How can that possibly be? One of the things they didn’t teach me in medical school is that health services delivered accounts for only 10 to 15 percent of a population’s health status. We can build the best hospitals, provide the richest health plans, and I can be the best heart surgeon possible, but behavior and how and where people live, eat, work, and play have a far greater impact on an individual’s health. Read more at Health Affairs. FORBES | The immediate question for those whose lives focus around lifting the health of individual Americans is, “What does Donald J. Trump’s presidency mean for health care in America?” At the heart of the answer is uncertainty. Trump is an “unknown unknown” when it comes to deep, thoughtful health policy. He has excelled in many fields, but at best he personally has only dabbled in the field of health care, which accounts for a fifth of our overall economy and affects literally every American. So, to begin to answer the question, we can only start with what he has said on the campaign trail and the bare-boned, seven-point “plan” on his website and conjecture from there. THE HILL | One single public health crisis accounts for nearly half (45%) of all child deaths under age five. Every 4 seconds, a person dies from this cause – approximately 21,000 every day. And shockingly, nearly one in nine people globally is affected. What is this epidemic that has taken so many lives? That has wreaked havoc on so many families? It’s want of a most basic need: we still have 795 million people worldwide who suffer from various forms of malnutrition and undernourishment. This is not a complex disease where we need to develop new treatments, build new clinics and health infrastructure, or educate patients on prevention and medication adherence. But it is a health challenge that requires bold leadership and the commitment of greater resources from developing and developed countries. The United States should lead the way, and our next President has a unique opportunity to mobilize the global community around this critical issue. CONCORD MONITOR | Since entering the U.S. Senate in 2011, Sen. Kelly Ayotte has emerged as a leading voice on U.S. national security and foreign policy. Through her service on the Senate Armed Services Committee, Sen. Ayotte has established herself as a strong defense hawk, consistently leading efforts to protect national security spending and to call for strong U.S. global engagement. What is less known is Sen. Ayotte’s equally strong record of support for increased investments in the tools of U.S. soft power. Sen. Ayotte has championed strategic investments in U.S. diplomacy and development programs, and she has been a particularly strong voice in Congress for women and girls around the world. While many Americans assume that our foreign aid dollars make up a substantial percentage of the U.S. government’s budget and that those dollars are often wasted, this could not be further from the truth. U.S. foreign assistance programs represent less than 1 percent of the federal budget, yet these programs have achieved remarkable results with strong bipartisan backing over the last two decades. FORBES | How is it possible that the people of the poorest country in the Western Hemisphere have to shoulder repeatedly the impact of one natural disaster after another? And what can we do as one of its closest neighbors – and by far the wealthiest country in the hemisphere – to best empower the people of Haiti to respond and to rebuild and indeed eventually to prosper after disaster strikes? These are the questions we ask today as we see a people struggling to recover from a devastating hurricane earlier this month and an ominous rise in cholera outbreaks. These are also the questions that a delegation of faith-based influencers from Hope Through Healing Hands and CARE asked last month as we visited Haiti to see what’s working and what’s not in terms of social and economic progress since the destructive 7.0 magnitude earthquake in 2010.